the PostController controller and its PostController::addAction() action method will be used for getting form data, and calling PostManager for saving the data to database. and add.phtml view template will render the form. * This form is used to collect post data. * This method adds elements to form (input fields and submit button). * This method creates input filter (used for form filtering/validation). As you can see from the code above, the PostForm class defines a ZF3 form with title, content, tags, and status fields. It also has the Submit button. Since we covered forms in details in previous chapters, here we do not explain the code presented above deeply. According to Domain Driven Design pattern, we put business logic into service models. In our Blog sample, we will create and register the PostManager service. This service will have the addNewPost() public method that will contain business logic of adding Post entity to database and associating it with one or several Tag entities. The PostManager service will contain business logic of the Blog sample. This business logic includes, but not limited to, adding new post to the blog. // The PostManager service is responsible for adding new posts. // Constructor is used to inject dependencies into the service. // This method adds a new post. // Create new Post entity. // Add the entity to entity manager. // Adds/updates tags in the given post. In lines 25-43, we have the addNewPost() public method which takes the $data variable as argument (this variable should contain the data entered by the website user into the form). We create a new instance of Post entity (line 28) and fill its properties with user-provided data. We use the EntityManager's persist() method (line 36) to add the newly created entity to entity manager. The addTagsToPost() private method is called (line 39) to assign the post with one or several tags. And the flush() method is used for applying changes to database in a single transaction (line 42). The addTagsToPost() private method contains logic for removing old associations between the post and tags (lines 49-52), then parsing comma-separated list of tags (line 55), and assigning new tags to the post (lines 56-73). * Constructor is used for injecting dependencies into the controller. // Check whether this post is a POST request. // Fill form with data. // Get validated form data. 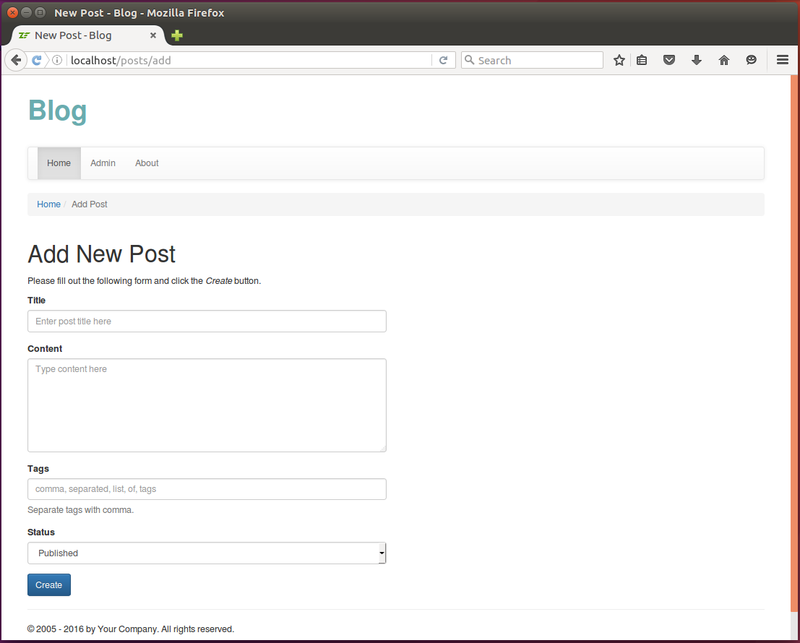 // Use post manager service to add new post to database. // Render the view template. Above, in line 33, we create an instance of PostForm form. In line 36, we check whether this is a POST request. If the request is a POST request, we fill the form with input data and validate the data. In case of valid data, we call the addNewPost() method on the PostManager service (line 49), and redirect the user to the list of posts. Please fill out the following form and click the <i>Create</i> button. Filling the form and clicking the Create button results in saving the new post to database. Then you are able to see the newly created post in the list of posts at the Home page.